Have leftover bananas? 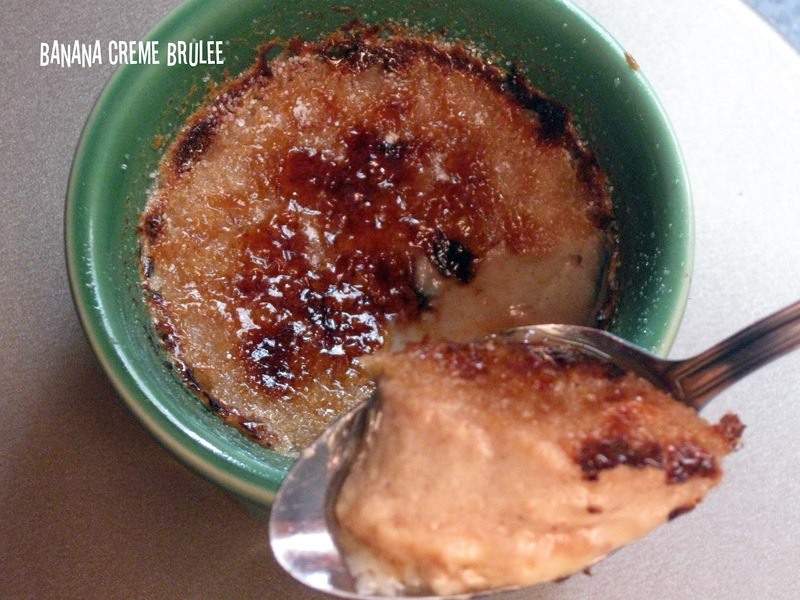 Banana Creme Brulee is your answer. I love creme brulee in any flavor. I also make a mean espresso creme brulee. But I had some leftover bananas and although banana bread was enticing I decided to make this instead. I don't remember ever experiencing this dessert until college and when I did I loved it. You know everyone's favorite part is the crunchy, sweet topping that they can crack with a spoon. Yup, that's mine too! Of course, in combination with the creamy, not quite as sweet dessert itself. Some people are afraid to make creme brulee but they shouldn't be. It's not an intimidating dessert to prepare. The ingredients are just mixed in a blender and poured in a pan and baked. Most recipes that don't involve chunks of fruit (like bananas) don't even say to put in a blender and are perfectly fine being whisked by hand until well blended. For the topping? You can use the broiler in your oven, unless of course you have a torch lying around at home to use. Then things get a lot more fun. :) I also say granulated sugar in this recipe but I have seen people use brown sugar and so that's okay too, whatever you have on hand. Combine the first 6 ingredients in a blender, and process the mixture until smooth (about 2 minutes). Add the eggs and egg whites to blender, and process just until smooth. Divide the mixture evenly among 6 (6-ounce) ramekins or custard cups coated with cooking spray. Place ramekins in a 13 x 9-inch baking pan; add hot water to pan to a depth of 1 inch. Bake at 300° for 55 minutes or until a knife inserted in center comes out clean. Remove ramekins from pan, and sprinkle each serving with 1/2 teaspoon sugar. Preheat broiler. Place the ramekins on a jelly-roll pan, and broil the custards for 3 minutes or until the sugar melts.